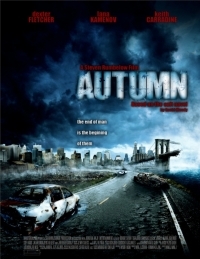 "As the last autumn leaves slowly peel away from the trees, a mysterious airborne virus ravages the planet, and within a few hours billions die. Victims suffer horrific deaths as their internal organs liquefy, and whole townsâ€™ expire within minutes. Soon cities become infested breeding grounds for the new apocalyptic virus. By the end of the first day there are only a handful of survivors. A small group of ordinary strangers are soon forced to work together to stay alive. The survivors are lead by Michael (Dexter Fletcher â€œLock Stock & Two Smoking Barrelsâ€, â€œDoomâ€) a lonely soft ware consultant, and Carl (Dickon Tolson â€œPeak Practiceâ€, â€œEastendersâ€) an ill-tempered mechanic. When Michael and the survivors escape from the infested city to an isolated country house, they discover the real horror has only begun! When the dead start to gruesomely reanimate the group have naive hopes that the â€œwalkersâ€, or the â€œmeat suitesâ€, would decompose and simply fall apart but they discover the longer the reanimated corpses are alive the more they learn, the cleverer they get, the more aggressive and treacherous they become â€“ the more they became killing machines. When Phillip Evans (David Carradine â€œKill Billâ€, â€œKung Fuâ€) is discovered as a lone survivor in the lifeless city, a new hope emerges, but nothing is as it seems in a world turned upside down, and hope soon turns into terror. In order to endure the winter each survivor must find the strength within themselves to fight their personal demons and find the courage to combat a war against the vicious dead. What follows is a shockingly clever adventure of survival, in a thrilling desolate world. This Autumn, the darkness will come!" I really hope they haven't massacred the storey line. Unfortunately, most movies made from excellent books do. How many movies about zombies laying seige to a house full of survivors do we really need? Actually there was more to the story about zombies laying siege to a house. That was just one part of a group of survivors. I really enjoyed the books and to be honest they are fantastic. They not only tell you about survival but about why it started and what was going on.